David T. Bizousky, M.D. has been with the Center for Orthopaedics & Sports Medicine (COSM) since 1994 but has been a practicing orthopaedic surgeon since 1991. Dr. Bizousky specializes in general orthopaedics with a special interest in sports medicine and arthroscopy. Dr. Bizousky is a native of Punxsutawney, Pennsylvania. He received his M.D. in 1980 from the Hahnemann University School of Medicine in Philadelphia. 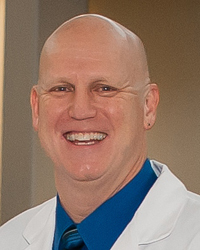 He completed a surgical internship in 1985 at Allegheny General Hospital in Pittsburgh, then served in the Army as a general medical officer from 1985 through 1987 in Stuttgart, Germany. In 1991 Dr. Bizousky completed an orthopaedic surgery residency at Fitzsimmons Army Medical Center in Aurora, Colorado. From 1991 until joining COSM in 1994, Dr. Bizousky served as an orthopaedic staff and chief surgeon for Combat Support Hospital in Heidelberg, Germany, and the 212the Mobile Army Surgical Hospital. During his time he was in charge of the care of many military and other American and European athletes. Dr. Bizousky is a fellow of the American Academy of Orthopaedic Surgeons and certified by the American Board of Orthopaedic Surgery. He is a member of the American Medical Society, Pennsylvania Medical Society, Pennsylvania Orthopedic Society, and Indiana County Medical Society. Dr. Bizousky serves as team physician for Indiana University of Pennsylvania (IUP) and area high schools. You can view a pdf of Dr. Bizousky’s Curriculum Vitae here.